More than 177,500 people are flocking to the Glastonbury Festival - creating a tent city with the same population as Norwich or Sunderland. But a huge infrastructure and sophisticated services are needed to raise this temporary town in a field in Somerset for one weekend a year. 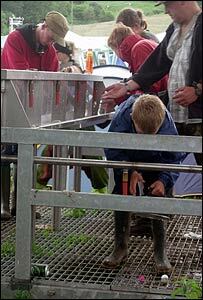 Glastonbury toilets may be the stuff of legend, but it is quite a job to deal with the human waste from 177,500 people over three days. There are 3,220 toilets in total - or one for every 55 people. Believe it or not, they are emptied and cleaned throughout the weekend, using vacuum tankers pulled by tractors. The effluent gets pumped into a huge lagoon at the north of the site, where a machine picks out clothes, phones and other items that have been dropped. Before this separator was installed a few years ago, workers had to do the job themselves in a boat. The waste is then transferred to 5,500-gallon tankers, which make 40 trips a day, day and night, to local sewage works. Most ends up 30 miles away at Avonmouth, on the Bristol Channel. 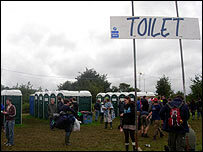 Glastonbury uses about 1.5 million gallons of water - far more than the normal local supply could provide. A new water main was installed 10 years ago, supplying two-thirds of the festival's needs, with the other third being brought in by tanker from a reservoir seven miles away. The water goes into five huge tanks before being pumped around the site to sinks, standpipes, cafes, stalls and any other areas that need it. More than 10 miles of pipes have been built beneath the fields over the years, with another 15 miles laid overground before the festival starts, all managed by Hunts Water. At the last festival two years ago, fans and workers produced almost 2,000 tonnes of rubbish. That is more than a town of a comparable size, according to festival rubbish manager Robert Kearle, because people produce more rubbish when they are partying. 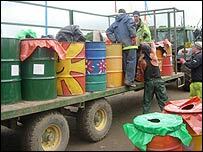 Two-thousand old oil drums are used as litter bins, 13 dustbin trucks travel around the site every day from 0600-1700, and 1,200 people work picking and sorting the rubbish. "They find just about everything you can imagine - from large stashes of drugs to huge amounts of money," Mr Kearle says. And they can keep anything that cannot be traced - one litter-picker received a nice bonus after coming across £6,000 in cash. Two years ago, 50% of all rubbish was recycled - including 230 tonnes of compostable food and biodegradable plates, cups and cutlery - with the other half going into landfill. Although the average tent is not hooked up to the power supply, Glastonbury still uses 30 megawatts of electricity over the weekend - about as much as the city of Bath. The vast majority comes from 200 generators dotted around the site, which use 100km of cabling to supply most of the stages, markets and backstage portacabins. 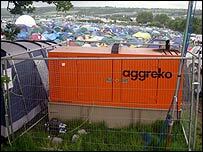 The firm in charge of power, Aggreko, has its own diesel supply on site and all-weather vehicles to ensure the fuel gets through. The festival is also making a big push to use renewable energy. The Green Fields - including the 1,000-capacity Croissant Neuf marquee - only use renewable energy, mainly from solar and wind power. There are also solar-heated showers, while generators in several areas will use biodiesel sourced from recycled cooking fat. 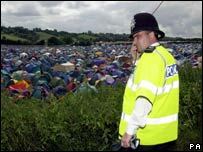 Avon and Somerset Police say the Glastonbury Festival is the biggest policing operation in the south-west, involving 25,000 police hours. Mounted officers, police dogs and helicopters are all deployed, with the operation co-ordinated from a temporary police HQ near the farm buildings. There is also a police office in the nearby village of Pilton and custody facilities two miles away at the Bath and West Showground. Festival crime has fallen sharply in recent years - down from 2,276 reported offences in 2000, when the gatecrashers flooded in, to 304 in 2005. Other emergency services also have a presence. The fire service deployed high-powered pumping equipment after the floods of 2005. The on-site medical services - including an emergency department, midwives and a dentist - are run by Festival Medical, which has been looking after fans for 25 years. Ambulance personnel are also on hand to take seriously injured people to hospital.